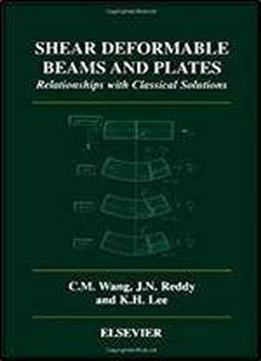 Most books on the theory and analysis of beams and plates deal with the classical (Euler-Bernoulli/Kirchoff) theories but few include shear deformation theories in detail. The classical beam/plate theory is not adequate in providing accurate bending, buckling, and vibration results when the thickness-to-length ratio of the beam/plate is relatively large. This is because the effect of transverse shear strains, neglected in the classical theory, becomes significant in deep beams and thick plates. This book illustrates how shear deformation theories provide accurate solutions compared to the classical theory. Equations governing shear deformation theories are typically more complicated than those of the classical theory. Hence it is desirable to have exact relationships between solutions of the classical theory and shear deformation theories so that whenever classical theory solutions are available, the corresponding solutions of shear deformation theories can be readily obtained. Such relationships not only furnish benchmark solutions of shear deformation theories but also provide insight into the significance of shear deformation on the response. The relationships for beams and plates have been developed by many authors over the last several years. The goal of this monograph is to bring together these relationships for beams and plates in a single volume. The book is divided into two parts. Following the introduction, Part 1 consists of Chapters 2 to 5 dealing with beams, and Part 2 consists of Chapters 6 to 13 covering plates. Problems are included at the end of each chapter to use, extend, and develop new relationships.